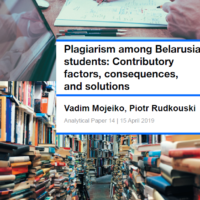 BelarusDigest > All > What Stands behind Another “Liberalisation” in Belarus? What Stands behind Another “Liberalisation” in Belarus? Just as before the 2010 presidential elections the Belarusian authorities show certain signs of liberalisation. They do not use aggressive hostile propaganda on TV and have allowed the opposition to campaign without interference. In addition, Alexander Lukashenka held a press-conference for three independent journalists, where he hinted on the possible release of the main political prisoner Mikalai Statkevich. These and other steps reflect an attempt to normalise relations with the West. Naturally, Lukashenka will preserve his authoritarian system of governance and the practise of holding elections. But he plans to carry them through quietly without notable repression, after which OSCE observers may prepare a relatively positive report. The geopolitical context – conflict in Ukraine and Belarus’ role in the peace process – can foster the unfreezing of contacts between Minsk and Brussels, both of whom seem ready for it. First and foremost, the liberalisation trend concerns the presidential campaign. Lukashenka himself publicly invited everyone who wishes to monitor the election and ordered his power ministers “not to catch or drag anyone who stands in the wrong place”, which was interpreted as giving the opposition carte blanche to campaign. Indeed, so far the authorities have allowed the opposition to campaign freely, travel across the country and even gather small rallies at markets, near plants and factories to collect 100,000 people’s signatures required for a candidate's registration. One opposition leader Anatol’ Liabedz’ka went even further and transformed a couple of his pickets into fully fledged protests for releasing political prisoners and punishing those responsible for political kidnappings in 1999-2000. Formally speaking, this could be considered as violating the Electoral Code because pickets are supposed to serve merely for collecting signatures. However, no sanctions followed. State TV and print media still praise the president, but, in general, speak more neutrally about the opposition. The most popular state TV channel ONT airs a weekly political talk-show, inviting independent experts and even moderate opposition politicians. In the meantime, Alexander Lukashenka for the first time since he came to power held a press-conference only for three journalists from the independent media: informational portal TUT.BY, Euroradio and Radio Free Europe. The event lasted 4.5 hours instead of the 90 minutes it originally planned. Lukashenka guaranteed no invasion of Ukraine from Belarusian territory, supported the promotion of the Belarusian language and promised that journalists will have full access to voting process and ballot counting. More importantly, Lukashenka admitted he was considering the release of the No1 political prisoner Mikalai Statkevich before the elections. Prior to the press-conference the standard response from Lukashenka was: “Statkevich is a criminal, is he asks for pardon, I will think about it”. For those who have observed Belarusian politics for a while, this liberalisation trend may seem familiar. In 2010, after two years of improving ties between Belarus and the EU, the presidential campaign started in a surprisingly free atmosphere. However, this political honeymoon ended on election night, when 700 people were arrested after a brutal crackdown on a mass opposition rally in Minsk. Since then Belarus-EU relations went through a deep crisis in 2011 followed by a very cautious reengagement. Parties negotiated a visa facilitation agreement and Belarus joined the pan-European Bologna process. The Ukrainian crisis also made its contribution: Minsk put on a hat of a reliable partner hosting peace talks and distancing itself from Russia. The EU started curtailing sanctions: the latest revision took place on 30 July when two dozen Belarusian officials were crossed off the visa ban list. However, the existence of political prisoners in Belarus stands in the way of normalising relations. After Russia intervened in Ukraine and fell under Western sanctions going into economic recession, it became a far less reliable donor and safe partner for Belarus. In these circumstances Lukashenka tries to improve ties with the West. He needs it to get some space for geopolitical maneuvering and maybe even assistance in receiving IMF loans or selling bonds on European stock markets. The unclear statement about Statkevich’s future may be seen as a trial balloon, an attempt to ask Europeans what they can give in return. How Realistic are Lukashenka’s Plans? It is rather obvious that Alexander Lukashenka cannot allow truly fair elections – it will bury the whole political system he depends on. The authorities will not let many opposition activists into electoral committees, or make the counting process more transparent. The state TV channels will not stop praising the president. Also, liberalisation will hardly cover areas Europeans pay less attention such as press freedom, freedom of associations or assembly. And for sure this liberalisation will end the moment its objectives are met or if it starts getting out of control. However, overall political apathy in Belarusian society and the fear of any revolution after the Ukrainian crisis already caused lack of enthusiasim in traditional protests after the elections. The absence of protests in its turn will mean no need for government suppression. As a result the OSCE may still call the elections unfair but notice some slight progress like more room for opposition agitation or no political arrests. It would be a repetition of 2010 (when everybody emphasised the liberal spirit of campaign before election night) but without the cruel disruption of protests and new political prisoners. After the elections Lukashenka hopes to approach the EU holding a moderately positive OSCE report in one hand and peacekeeper image in the other. If in addition he will release Statkevich and some other political prisoners (all in all, six people by human rights activists' assessments), the road to lifting European sanctions seems open. Elections come right on time – at the end of October the EU Council annually reviews its sanctions against Belarus. On the other hand, according to diplomatic sources, the EU has prepared an internal document, some sort of a road map, providing certain concrete steps the EU can undertake in relations with Belarus, if major political obstacles are removed. The document includes trade and investment facilitation measures, technical support in various fields. The 2015 presidential elections have fully predictable results in terms of the winner. However, their implications on the relations between Belarus and the EU can be crucial. Smooth elections without repression and the release of key political prisoners may finally unfreeze the comprehensive relations with the West. Geopolitics played its part, now it’s time for Alexander Lukashenka to play his. Belarus and the Ukraine Conflict: More Losses Than Gains? Belarus has already suffered economic losses from the Donbass war as its trade with Ukraine has fallen by more than 40% in 2015. In addition, it has hosted more than 100,000 refugees and had to resist significant Kremlin's pressure. Seeking to prevent the pressure, Minsk decided to avoid siding with anybody and developing relations with all involved parties. Maintaining friendly relations with Moscow and Kyiv, it rekindled its relationship with Europe. Now, Minsk sent another message as President Lukashenka urged Americans to participate more actively in the Ukrainian peace process. Minsk's trade links explain much in its behaviour regarding Ukrainian crisis. Having a fragile national economy, the Belarusian government cares about Ukraine as a partner. While bilateral trade in goods in 2012 made up almost $8bn, last year it fell to just $5bn. It was 7.5% of the whole Belarusian foreign trade. That is significantly less than with Russia (48.7%) yet still a lot. Even more important is the considerable positive trade balance that Belarus constantly had in trade with Ukraine, because Minsk for years has been struggling with a large negative trade balance in Belarus' foreign trade. Minsk opted for its current neutral position taking into account not only Russia's and Ukraine's significance for the national economy but also the EU's. After all, more than 30% of Belarusian exports in 2014 went to the EU, and about 20% of imports came from there. To revive trade with Ukraine, Minsk agreed last month to wider use of Ukrainian hryvnas in bilateral trade despite obvious risks and losses related to such a decision. The significance of the links with Ukraine for Minsk were emphasised by Minsk daring to supply Kyiv with military equipment. Unlike relations with Europe, Minsk's relations with US remain essentially in the same troubled state. Washington recently extended sanctions, and put Belarus into the group of the worst violators of human trade, worse even than Afghanistan and Uzbekistan. Hence the new moves by Minsk. Last week, Lukashenka met with US Republican congressmen Dana Rohrabacher, Gregory Meeks and Stephen Cohen. On Tuesday, in the presence of a journalist of US-run Radio of Liberty he emphasised the necessity of bigger US engagement in solving the Ukrainian crisis. Nevertheless, the uneasiness that Minsk feels about the conflict to the south of the Belarusian border find its expression in many occasions. For example, usually Belarusian Special Operation Forces celebrate Paratroopers Day at their military bases. This year, however, the Belarusian army made a point of staging military shows of special forces in the centres of Brest and Vitsebsk where the most renowned special forces units are stationed. Top Belarusian officials openly discuss what they consider a threat. On 4 August, Lukashenka told journalists, “there is a lot of violations on the [Belarus-Ukrainian] border… Violations ranging from smuggling to – what worries me the most – infiltration of persons with weapons.” Two days earlier, acting Secretary of the Security Council Stanislau Zas' also assured a Belarusian TV channel that the government was taking measures to prevent weapons from Ukraine entering Belarus. 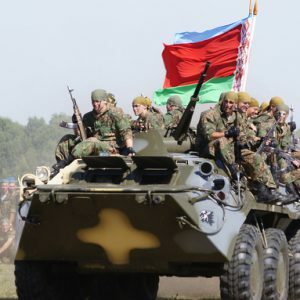 On 11 June, the chairman of the Belarusian State Security Committee Valery Vakulchyk said that Belarusians who participate in hostilities in Ukraine will face criminal persecution for mercenary activities. “Men killing men… How can we accept it? And then they will come here with the experience of killing people.” So far, Belarusian state bodies, however, have not launched criminal investigations against any of these combatants fighting on either side. He is not the first opposition activist to do so, and earlier former political prisoner Vasil' Parfiankou also joined the battalion of the Organisation of Ukrainian Nationalists. These are not individual cases. On Friday, Nasha Niva announced that all Belarusian nationalists fighting in Ukraine would be assembled into one military unit. We are carefully watching the situation in Ukraine. It is necessary to fortify the borders, to maintain public order. And the most important point is that our people, our countrymen shall understand the value of peace and serenity, realise that they are fragile and defend them. Before the October presidential election in Belarus, these words sound as a warning about danger of massive protest actions. Belarus faces ever more risks related to the conflict in Ukraine. These risks can ruin the country and its independence, if destabilisation and foreign intervention occurs. Yet these risks can also help Minsk to move on the way to changes and building a viable independent statehood. Both scenarios are probable, and much depends not on Belarus.